Director (and co-writer) David King (The Mighty Boosh had a no tall order in adapting Paddington Bear for the screen, and in 2015 no less. Michael Bond’s books are gentle, though not without a sense of adventure, but certainly without the highly kinetic pacing required of family films today. Amazingly, Paddington works better than I ever would have guessed, especially after seeing the trailer where the bear licks an ear wax encrusted toothbrush. The key is that the core spirt of Bond’s books is wonderfully present in the film. Paddington was created in part to recognize and promote those families in the country who took in London children fleeing the Blitz during World War II. The film starts with a British explorer arriving in Darkest Peru and discovering a bear couple (Michael Gambon and Imelda Staunton) that are highly intelligent. By the time their nephew Paddington (Ben Whishaw) is a cub, they have developed the ability to speak as well as make their own marmalade. 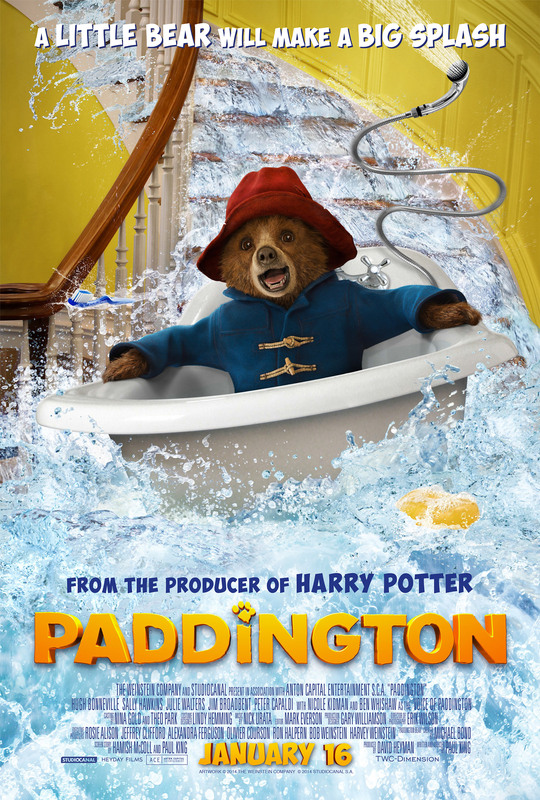 After an earthquake strikes their home, Paddington is sent to London to find a new life. 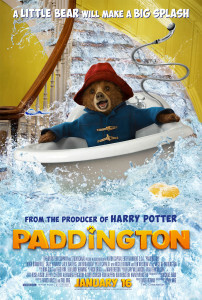 Luckily he meets the Brown family, and while Mr. Brown (Hugh Bonneville) is reluctant to bring home a strange bear, Mrs. Brown (Sally Hawkins) recognizes that Paddington needs help. And so he comes to live with them, their children (Madeline Harris and Samuel Joslin) and their house maid, Mrs. Bird (Julie Walters). As Paddington clumsily adjusts to life in London, a taxidermist (Nicole Kidman) is determined to add the rare bear to her museum’s collection. This is a carefully made film, with clear investment in treating the material respectfully but making it appeal to a modern film audience.The themes resonate well, teased out between action sequences cribbed from The Adventures of Tintin and Mission Impossible: Ghost Protocol (not a complaint, those are great modern action films to draw from). In a world where most do not bat an eye at a bear in a hat and duffel coat, it allows a quick line to explain why all of London’s sights are inexplicably seen on the way from Paddington Station to Windsor Gardens. Paddington is a wonderful surprise, a perfectly cozy way to spend a cold winter afternoon. Paddington opens today in Philly area theaters.